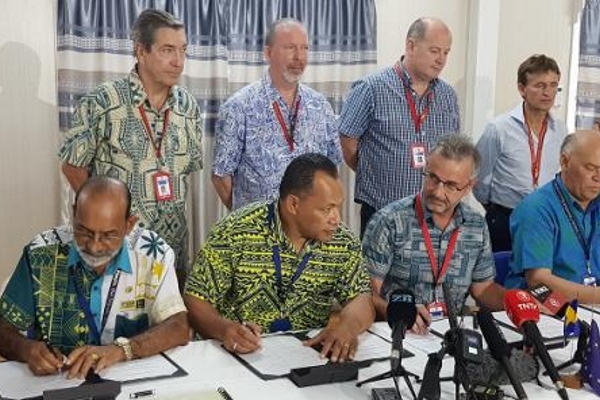 The EU and Sweden have agreed to contribute €45m ($52m) to a project that aims to help protect marine biodiversity in the Pacific – and crack down on illegal activities such as fish ‘laundering’. The Pacific-European Union Marine Partnership Programme (PEUMP) – backed with €35m from the EU and €10m from Sweden’s government – will try to help regional organisations tackle issues like unsustainable fishing, the impact of climate change and exploitation of people working in the sector. It’s also planning to crack down on fraudulent behaviour like laundering. That involves a process called transhipment, in which large cargo ships with legitimate fishing permits taken catches from smaller, illegal fishing vessels to bypass controls, according to a report from the Organised Crime and Corruption Reporting Project (OCCRP). Pacific governments and non-governmental organizations have been pushing for a ban on transhipment at sea, which is a particular problem in the tuna industry. According to the Pacific Islands Forum Fisheries Agency (FFA), transhipment at sea is most prevalent in distant water longline fisheries, enabling vessels to offload catch to a refrigerated carrier (reefer) or another fishing vessel at sea, either within exclusive economic zones (EEZs) or more commonly, the high seas. “The rationale for doing so is to save fuel and maximise fishing time by not having to return to port for as long as around 18 months,” it says, but that makes monitoring and law enforcement challenging as it rests largely with flag states, a number of which are ‘flags of convenience’ with limited connection or control over the vessels.